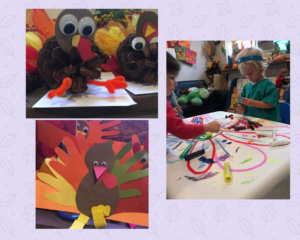 This week we continued our November theme, “Fall Family Traditions.” In preparation for our “Thanksgiving Feast” for preschool prep, children made pinecone turkeys with cut out handprints, as well as turkey hats to wear at our upcoming “Thanksgiving Feast.” They enjoyed gluing googly eyes on their turkeys and worked on their fine motor skills by squeezing glue and placing feathers, noses, and waddles onto their Turkeys. 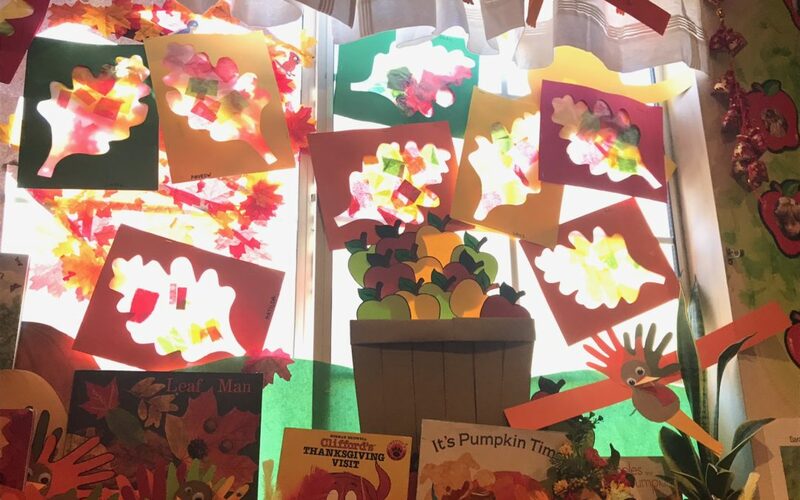 The children also worked together to create big, colorful Turkey drawings! A wonderful group project! Our Fall sensory table contained Indian corn as well as seeds, gourds, and farm animals. Adding the corn kernels and talking about Indian corn was exciting for the children and they learned new words related to Indian corn and the sensations of new objects being “smooth,” “bumpy,” and “prickly.” In addition to our sensory table, we added ocean-colored water beads to our sensory play this week along with sea creatures that the children enjoyed playing with together and identifying. 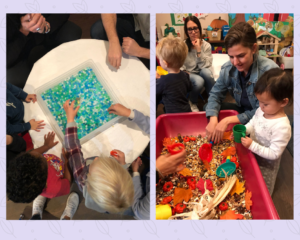 The children really enjoyed touching and feeling the water beads, which were actually calming to many of the children (good for regulation). Our dramatic play area contained farm animals and people. The children really liked playing with our farm animals and giant Legos this week. Our special snack was corn bread. Yum!